There are several ways to get cloud storage in Ubuntu, and access it from Nautilus with products such as Ubuntu One or Dropbox. But if you’re running out of space with those services, you may also consider using your Google Drive account with Insync (Beta). At this point, reboot or restart nautilus (“nautilus -q” in a terminal window). I’ve then used Dash to launch Insynq. This just launched insync website, and allowed me to register my Google Drive account. You should now see Insynq shows up in your home folder. It may be a good idea to add it as a bookmark as well. At this point, you should realize something is not working that well since Insync does not show in the contextual menu. That’s because you need to run insync manually in a terminal window, and everything is good. If you right-click on a file inside the Insync folder, you’ll have the option to open it in Google Drive, share it, get the shareable link, check the version (if already synced) or see the recent changes. If you right-click on any of the other folders in your computer, you’ll be able to send files or directory to your Google Drive account automatically. 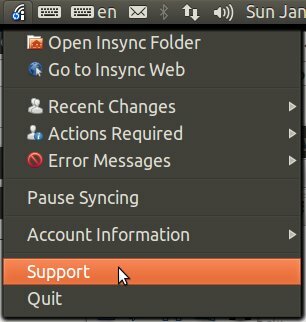 Insync Indicator should also appear in Ubuntu top bar, and gives access to notifications (error message, actions required), links to Insync, and a sub-menu to manage accounts (multiple accounts are supported). 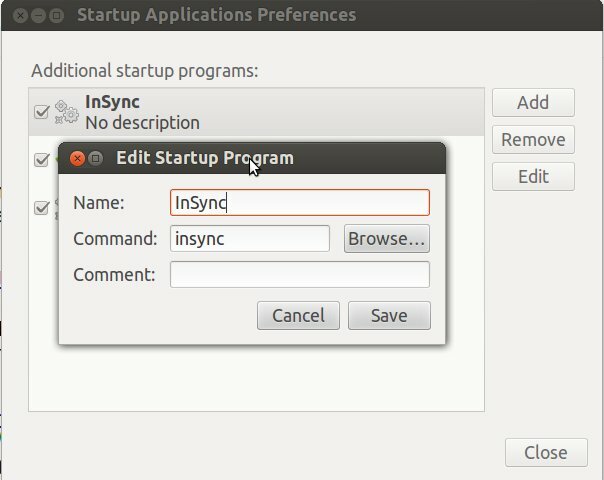 OMG Ubuntu also reports that Insync provides support for offline editing of Google Doc with programs such as Libre Office. But that’s not something I’ve tried. Since I don’t fancy typing insync in a terminal, each time I start my computer, I’ve added it to the “Startup Applications”. Even though it’s still beta, Insync works pretty well for me so far. Apart from Ubuntu, it’s also available for other Linux distributions (Fedora, LinuxMint, OpenSuse…), Windows, Mac desktop PC operating systems, as well as several mobile OSes (Android, iOS, Blackberry OS, and Windows Phone). The source code is not available, so it won’t work on ARM Linux for now.